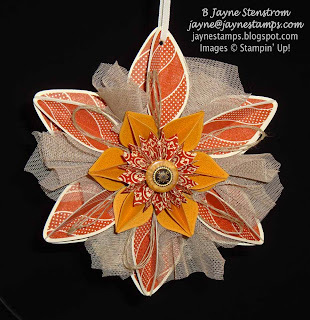 What a wonderful stamping week I've had! Last Saturday I was able to stamp with a group of close demonstrator friends, Monday I was able to spend almost the whole day in my stamp room organizing and stamping, I attended my upline's meeting on Tuesday evening, yesterday a friend and I took a trip to stamp with another demonstrator, and today I had one of my downline members come over to make a holiday ornament! If that's not a great week, I don't know what is! I just recently found out about Push-Pops. Guess I'm a little behind the loop (it wouldn't be the first time). 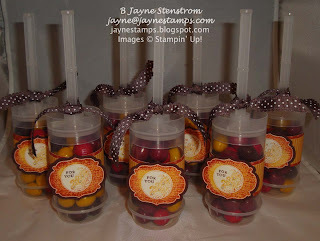 I went onto Pinterest and found all of these adorable ideas for Push-Pops with cake, cookies, pudding, etc. in the container. 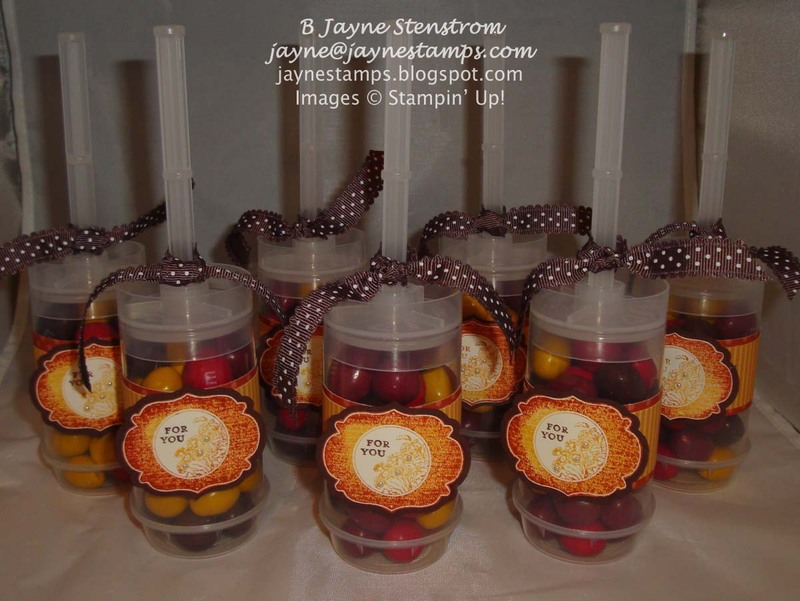 I just got my containers last week and wanted to make a little something for the gals I was stamping with last Saturday, so I filled mine with Peanut M&M's and made a wrapper/label in colors that coordinated with the M&M's. Here is a close-up of one of the Push-Pops. The label is from Apothecary Art. I inked it up with my More Mustard dye ink, then rock-n-rolled it in Cajun Craze. I took my Chocolate Chip marker and went over the "For You" so it stood out. 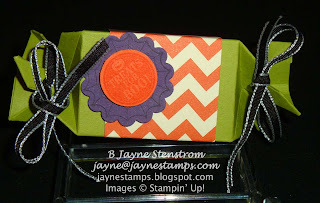 After I stamped it, I cut the label out and used the Labels Collection Framelits to cut a piece of Chocolate Chip cardstock to go behind it. It's finished off with some DSP from the Regals Designer Series Paper Stacks and Chocolate Chip 1/2" Scallop Dots Ribbon and some Basic Pearls. Of course, while I was making these there were a few M&M's that escaped that I had to "rescue" (and eat!). 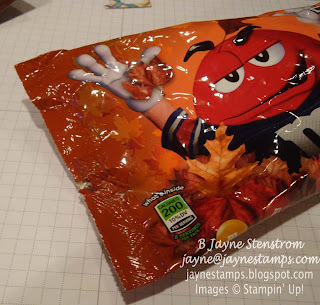 Speaking of escaped M&M's, I almost had a bag of M&M's destroyed. Oh, the horror! That would have been a catastrophe (and I don't use that word lightly!). We have two male cats - one of whom likes to EAT plastic. He will eat the handles off the bags from the grocery store, etc. so we have to be very careful what we leave lying around. I think one of the cats found my M&M's and decided that the bag was quite to his liking. Fortunately, he didn't make it through the actual bag - just the edge. Good thing I didn't catch the cat "in the act", or he might have lost one of his nine lives! 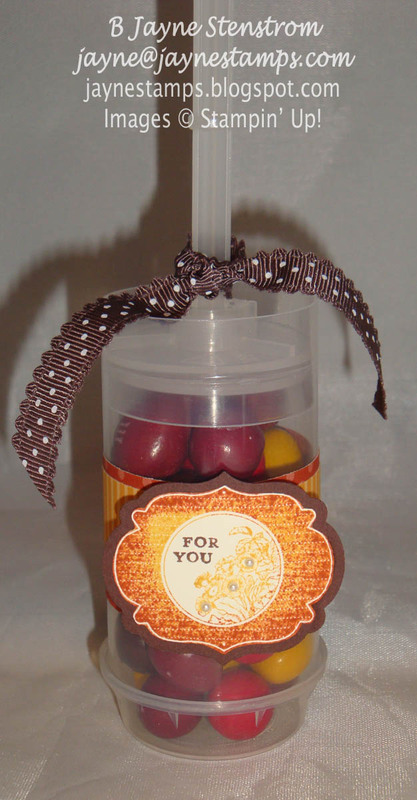 Another cute way to wrap candy is using our . . . (wait for it) . 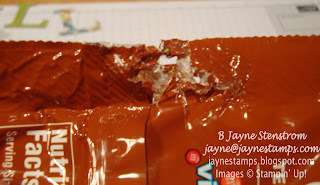 . . Candy Wrapper Die! Diane Kipp made this adorable container and embellished it with the Mixed Medley Hostess Set, some Howlstooth & Scaringbone DSP, and 1/8" Basic Black Taffeta Ribbon. 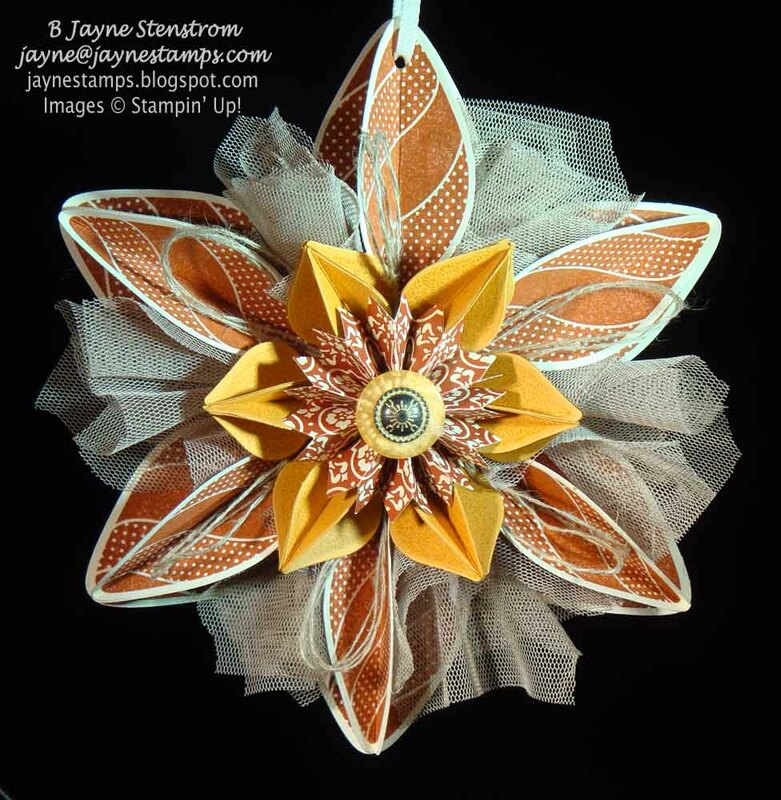 Here's another cute idea from Diane. 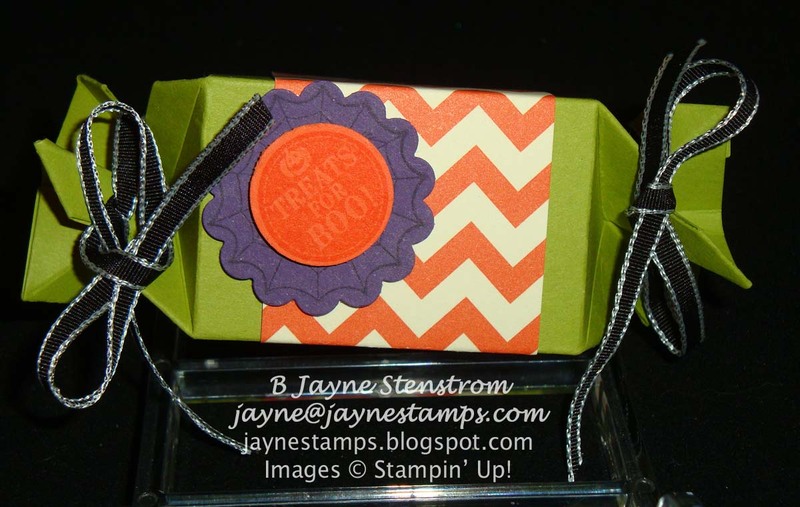 She stamped on some of our skinny Cellophane Bags (1"x8") using Toxic Treats stamp set and black StazOn ink. She then carefully slid some candy corn into the bag and tied it closed. Cute, huh? And here's a close-up of the center. I think it looks like some kind of flower, don't you? 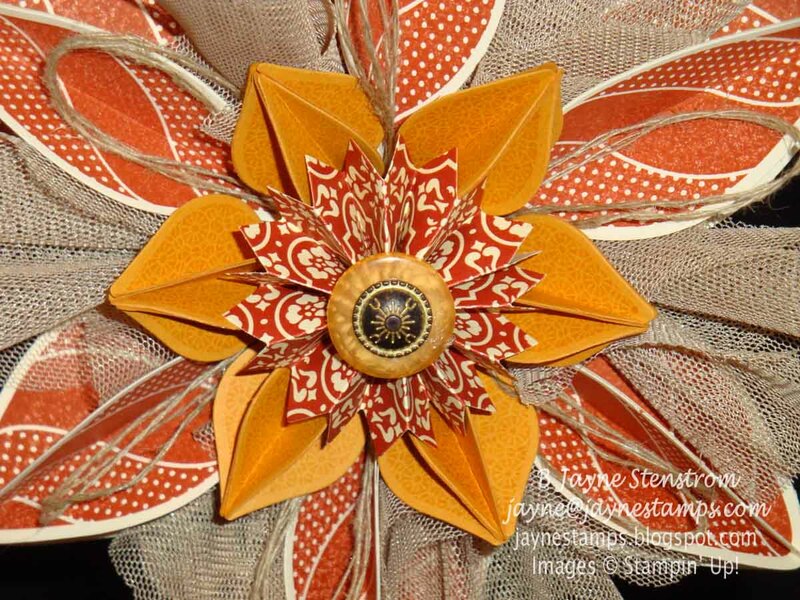 The center medallion is made with some DSP from the Comfort Cafe collection and topped with a More Mustard Designer Button and an Antique Brad. I was so pleased with how it turned out! Here is a picture taken without a flash so you can get a better idea of what it looks like in real life. So I'm up to four ornaments that I've made so far and I'll be making another one next Tuesday when some friends come over to stamp. 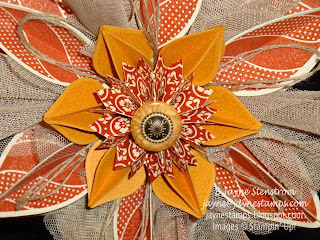 I'm thinking about making that one in reds and pinks for Valentine's Day, but I may change my mind between now and Tuesday evening. If you have any ideas, I'm open to suggestions!